Introducing the new Donjoy Total Range of Movement (TROM™) Adjuster Knee Brace – the first post-operative brace truly designed to easily, comfortably and consistently deliver controlled off-loading, conducive to creating the optimal recovery environment. The goal of reducing discomfort while achieving the highest degree of therapeutic healing from knee surgery has found a state-of-the art device designed to do just that. The TROM™ Adjuster Knee Brace is applied science in an attractively simple design that has revolutionized the healing process for patients. Enduring the recovery process following meniscal repairs, major ligament surgery, osteochondral defects, patella realignment, condylar or tibial plateau fractures, high tibial osteotomy (HTO) or other surgical repair involves relieving weight bearing on the knee while supporting flexion and extension during recovery. The TROM™ Adjuster introduces the most comprehensive post-op brace solution for patients using the successful TROM™ platform. This fully adjustable knee brace revolutionizes the healing process through an easy-on, easy-off design that presents an improvement over conventional methods while still providing the ability to serve the purpose, such as that previously achieved with groin to toe casting. The ability to adjust the degree of flexion and extension as well as being able to lock-out the brace has actually proven to reduce the amount of time spent in recovery with its versatile ease of use. There are a host of improvements in recovery from surgery facilitated by the use of the TROM™ Adjuster Knee Brace. First and foremeost, the flexibility to make adjustments in the levels of immobilization for the prescribed protocols has been a tremendous aid in limiting time spent healing, improving the integrity of joint recovery, allowing for improved surgical outcomes, reducing the pain typically associated with these recoveries and decreasing the need for anti-inflammatory medications. The convenience of eliminating the process of cast immobilization responds to a host of otherwise related difficulties, not the least of which is the incessant itching associated with such therapies. Further, the ability to easily remove the padding that supports the brace to facilitate the best hygienic conditions ensures comfort throughout the period of physical therapy. The pads are held in place with hook and loop technology which also allows for custom placement. This will prevent skin contacting any of the firm parts of the brace and help prevent chaffing. Patients who have experienced the TROM™ Adjuster Knee Brace are convinced that the manufacturer took the time to think of everything. There is nothing left to improvement but the health and best healing from knee surgery, something that need not bring nearly the anguish previously associated with the recovery time required. About MMAR Medical: MMAR Medical Group Inc. is a premiere medical orthopedic brace distributor in North America, carrying a large selection of post-op hinged braces including the Donjoy Trom adjustable knee brace. 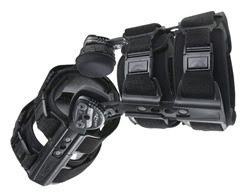 Based in Houston Texas, www.MMARMedical.com carries one of the largest selection of sport rehab knee braces in the Americas.